Eric Co is the Senior Program Officer of Marine Conservation for the Harold K.L Castle Foundation. Eric has over 15 years professional experience working in the fields of marine science and conservation in Hawai‘i, the Pacific Islands, the Caribbean, and Australia. 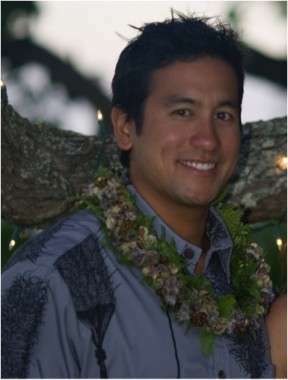 His Master’s thesis was a study on the integration of Traditional Hawaiian marine management with Western, science-based approaches an issue of key importance in the establishment of Community based Subsistence Fishing Areas. Eric lives on Molokaʻi with his wife, daughter and son. Mahalo to Eric for sharing this piece with us. In October of 2014, the Board of Land and Natural Resources (BLNR) unanimously voted to implement Hawai‘i’s first Community Based Subsistence Fishing Area (CBSFA) in Hā‘ena, Kaua‘i. Congratulations to all who have worked so long and hard to make this a reality, with patience, persistence, and pono. Uncle Samson Mahuiki and family testify at Hanalei Elementary School October 3, 2014. The Board was tasked to weigh the local impacts of the Hā’ena Rules Package, including to commercial interests. Owing to the collaborative process through which the CBSFA designation was formulated, and the negligible impacts it was clearly found to have, the BLNR unanimously voted to pass the proposed designation. The first designation of its kind and over a decade in the making, it now only awaits the signature of our new Governor to be become law. We hope the Governor can trust in the just, inclusive, and deliberate due process that culminated in the good judgment of the members of the Board of Land and Natural Resources. Until he decides, we wait at a crossroads. Our nearshore marine areas are not as healthy as they once were, an observation to which a vast majority of us agree. 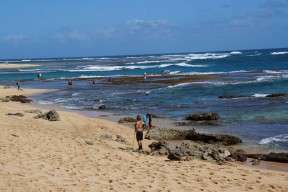 We all want the same thing, to restore a healthy Hawaiian ocean that can sustain us in the myriad ways we have called upon it to do so for centuries—physically, economically, culturally, spiritually. But what is the best path forward to restoration? As a dear friend once taught me, Hawai‘i is well loved, but it is not well cared for. Land-based sources of pollution, invasive species, overuse and poor management have all played a part in our nearshore ocean’s decline. At the same time, users expect to be able to partake in the ocean as their parents and grandparents once did, and it is unfair to ask them to change their ways. The reality is that we are not overusing a healthy nearshore ocean, rather in many places we are simply using an unhealthy one. This is frustrating, unfair, and deeply concerning to many of us. The assignation of blame may help us to release some of our frustration, but it does not get us closer to a solution. Ultimately, we must face the reality that while many of the issues facing our ocean are not our fault, they are still our problem. And so they must be our solutions. All of ours. We also must recognize that solutions will necessitate some sacrifice from everyone. We all must be expected to give to our ocean, not just take from it. We all must mālama our ocean, not just use it. We all must agree to value it better as a community. Consequently, from the start of the CBSFA process, the Foundation has been supportive of both government and community groups Statewide, like the Hui Maka‘āinana o Makana in Hā’ena, who are aiming to establish nearshore marine areas where traditional and sustainable marine resource use can be honored and perpetuated. The Hui consists of fishing families that have resided in the area for generations. But the group also reached out to the commercial sector and residents—old and new alike—to reach the best solution set possible for the greatest amount of people in their community. Community-driven, collaborative processes such as this are now occurring in other places in the State where local communities hope to see their resources sustained, and traditional practices preserved. All of these processes include participating fishermen and other users with deep ties to each of those areas. As such, these are efforts devised to bring users and interests together, not further divide them. We value our natural resources. We value our culture. Now we can properly value the traditional practices that connect the two, and ensure their perpetuation for generations to come. Because traditional and cultural practices are not artifacts to be preserved in books and museums, but solutions to be practiced as keys to a sustainable future. When the Governor reaches his decision, we hope it will be a moment that can be remembered as the beginning of a time when we returned to collaborative, effective, and culturally relevant management of our natural resources. A time when we began to mend the divides that exist between various segments of Hawaiian residents, rather than allow them to deepen. A time that helped to shape Hawai‘i’s destiny as one that finds balance among the many interests and needs of our ocean. A time when we took meaningful, effective steps toward restoring the health of our nearshore marine resources and our communities. This entry was posted in Uncategorized and tagged CBSFA, E Alu Pu, Haena. Bookmark the permalink.